New England Patriots head coach Bill Belichick says he had "no knowledge" of any plan to intentionally deflate balls during their win over Indianapolis Colts that sent them to the Super Bowl. The NFL is continuing to investigate claims 11 balls were deflated in the rain-hit 45-7 win over the Colts in Sunday's AFC Championship game. 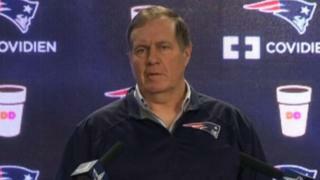 Belichick insisted: "In my entire career, I have never talked to any staff member about football air pressure."